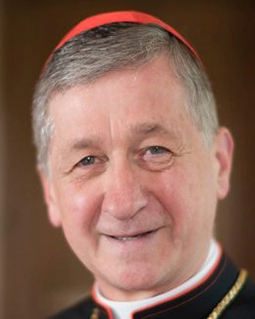 VATICAN CITY— Pope Francis named Cardinal Blase J. Cupich of Chicago to be part of the organizing committee preparing for a meeting of the world’s bishops’ conferences and representatives of religious orders to address the abuse and protection of minors. The Feb. 21-24 Vatican meeting is not only “about keeping children safe from harm worldwide,” wrote Greg Burke, head of the Vatican press office, in a written statement Nov. 23. “Pope Francis wants Church leaders to have a full understanding of the devastating impact that clerical sexual abuse has on victims,” he stated soon after the Vatican announced the members of the preparatory committee. The Pontifical Commission for the Protection of Minors, headed by Boston Cardinal Sean P. O’Malley, and some survivors of abuse by members of the clergy also will be involved in the preparatory work for the meeting, the Vatican stated. “We must continue to embrace and practice a commitment to zero tolerance, work for greater transparency, including the release of names of clergy accused of abuse, and encourage all religious orders to adopt a similar policy and cooperate with civil and legal authorities. Above all else, we must place the support and pastoral care of survivors first,” he wrote in a statement Nov. 23. Cardinal O’Malley stated the pontifical commission, as an advisory body to the pope, proposed the global meeting for the world’s bishops. He added the commission has hosted meetings between survivors and groups of newly named bishops. “The pope is seeking both a comprehensive understanding of past failings as well as global solutions moving forward,” the cardinal said Nov. 23. Cardinal Cupich said it will be critical that all Church leaders take “ownership for our failures fully in order to ensure they are not repeated.” This will require clearly defining responsibilities and establishing “responsiveness, transparency, and accountability, particularly for bishops,” he added.